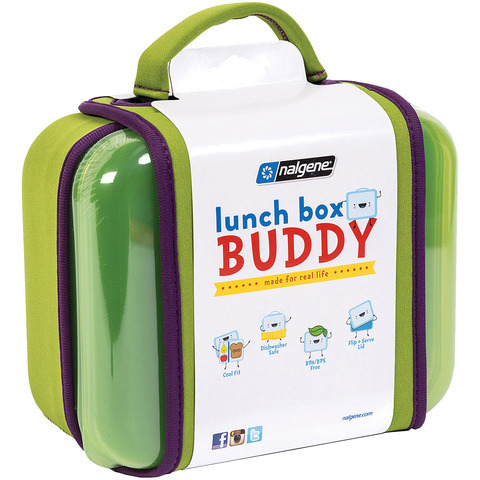 Nalgene Lunch Box Buddy is a simple design, easy to assemble/reassemble, easy to clean, fewer parts and no weak points like zippers or hinges. The Lunch Box is big enough to accommodate a variety of reusable containers, individually wrapped snacks, and drink containers. The easy to open lid serves as a plate to help keep germs away from food. The adjustable ice pack offers three ways to organize for more flexibility in packing. The neoprene sleeve helps contain the lunch box during transit and offers insulation. BPA free, dishwasher safe, neoprene sleeve is machine washable.